Posted January 13, 2019 by Sheri Bell and filed under the categories Apologetics, Journey Together. Welcome! Thanks for joining us for this, our second post in our new year-long blog series we’re calling “Journey Together.” Our aim in this post is to dive further into whether we can trust the Bible. 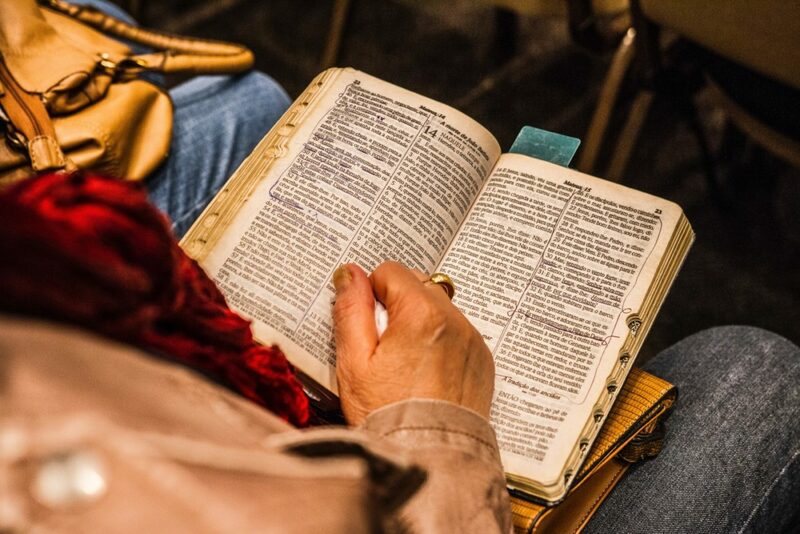 The contents of the Bible were written over a period of over 1500 years, by 40+ authors from every walk of life: kings, fisherman, statesmen, poets, philosophers — even peasants. Some wrote in the wilderness, others in dungeons, some in a palace, and others while on military campaigns. And they wrote from three different continents, and in three languages, Hebrew, Aramaic, and Greek. Wow! Can a book so unique really be factually and historically true? Is the Bible, as some believe, merely a “man-made” work of fiction — or a book guided by the hand of God? “The case for the reliability of the New Testament,” asserts scholar and prolific writer Dr. Howard Vos, “is infinitely stronger than that for any other record of antiquity.” Let’s look at why he can confidently say this. Because you and I weren’t there to see it for ourselves, we trust that our knowledge of the past is based on verified sources: written, oral, and physical testimony. Written testimony is a written record of what happened. Oral Testimony, the primary way in ancient times of faithfully passing history from one generation to the next, relied on meticulous storytelling. Physical testimony is tangible evidence, such as a fingerprint, photograph, clay pot, or manuscript. ~ How do we know what the Nazis did to Jews during World War II? Because of the horrific testimony that can’t be denied by those willing to look at the facts. Credible eyewitness testimony is critical to our understanding of what really occurred in the past. So why do scholars have to admit that Jesus really did live and die? Because evidence, even from non-biblical sources, claims that He did. Why do Christians believe Jesus also resurrected? Again, because of compelling eyewitness testimony. We can trust that the Book of Acts is legit. Or can we??? You might be thinking that historical testimony isn’t necessarily reliable. Because we all know that sometimes people lie. And sometimes they intentionally skew the truth. Maybe, you’re thinking, their memory was faulty. Or maybe the disciples just wanted to make themselves seem important or grab power! Don’t miss this critical point: the apostles presented their facts in the presence of knowledgeable, hostile people who would have immediately known if they were presenting false information. The eyewitnesses of the events in question were still alive when the traditions were being completely formed about Christ! Even better: among those eye witnesses were bitter enemies of this new religious movement who would have contested and exposed any false statements the apostles tried to concoct or spread! That, in itself, is authentication. There are two standard tests exist by which all historical documents can be vetted. We’d start our testing by examining the paper and ink used to record the manuscript. Then we’d study its timeline — how far the manuscript is removed from the original (autographa). Next we would determine the manuscript’s approximate date. We could use clues such as ink color, letter size, punctuation, ornamentation, and even text division. Want to know what scholars find when they examine the Bible’s timeline? That they can date the earliest version of the written New Testament to within fifty years of Christ’s death! You might be thinking that’s a long gap, but let’s put the gap into perspective. The closest version we have of all other non-biblical historical documents is closer to hundreds of years. There is a 50-year gap between the New Testament and the autographa — but a 500-year gap with the Iliad! We also can test a document via archaeology. Non-biblical historical literature verifies certain facts about Christ. We know that He lived during the time of Tiberius Cesar. That He lived a very virtuous life. That He performed miracles. That He was acclaimed to be the Messiah. that He was crucified under Pontius Pilate, on the eve of the Jewish Passover. That darkness and an earthquake occurred when He died from crucifixion. That His disciples interacted with Him for 40 days after He rose. That His disciples were willing to die for their beliefs. And that Christianity spread rapidly, as far as Rome. Another benchmark scholars consider: how many copies of the original text exist? The more copies available to review, the easier it is to reconstruct the original document. Again, let’s compare the number of manuscripts of literature of antiquity. Many people consider the Roman historian Tacitus to be Rome’s most important historian. Yet there are only twenty manuscripts that remain of his annals. Of Pliny the Younger, only seven manuscripts survive. Of Aristotle, only 49 manuscripts. Of the Greek historian, Herodotus, only eight manuscripts survive. Of the Iliad, 643 manuscripts exist. But of just the New Testament, scholars have confirmed the existence of 24,633 manuscripts! The evidence for New Testament writings is so much greater than the evidence for writings of other classical authors. Catch up: The introductory post to this series. Last week’s post: Meticulous Scribe, Trusted Manuscript. To view videos of Josh speaking on the topic of the trustworthiness of the Bible, click here.